Geopolitics (from Greek γῆ gê "earth, land" and πολιτική politikḗ "politics") is the study of the effects of Earth's geography (human and physical) on politics and international relations. While geopolitics usually refers to countries and relations between them, it may also focus on two other kinds of states: de facto independent states with limited international recognition and; relations between sub-national geopolitical entities, such as the federated states that make up a federation, confederation or a quasi-federal system. At the level of international relations, geopolitics is a method of studying foreign policy to understand, explain and predict international political behavior through geographical variables. These include area studies, climate, topography, demography, natural resources, and applied science of the region being evaluated. Geopolitics focuses on political power linked to geographic space. In particular, territorial waters and land territory in correlation with diplomatic history. Topics of geopolitics include relations between the interests of international political actors and interests focused within an area, a space, or a geographical element; relations which create a geopolitical system. "Critical geopolitics" deconstructs classical geopolitical theories, by showing their political/ideological functions for great powers. According to Christopher Gogwilt and other researchers, the term is currently being used to describe a broad spectrum of concepts, in a general sense used as "a synonym for international political relations", but more specifically "to imply the global structure of such relations", which builds on "early-twentieth-century term for a pseudoscience of political geography" and other pseudoscientific theories of historical and geographic determinism. Oil and international competition over oil and gas resources was one of the main foci of the geopolitics literature from World War and onward. From about 2010, a new branch of the literature emerged, focusing on international power relations related to renewable energy. Government with the influence and inclination to dominate the sea. Mahan distinguished a key region of the world in the Eurasian context, namely, the Central Zone of Asia lying between 30° and 40° north and stretching from Asia Minor to Japan. In this zone independent countries still survived – Turkey, Persia, Afghanistan, China, and Japan. Mahan regarded those countries, located between Britain and Russia, as if between "Scylla and Charybdis". Of the two monsters – Britain and Russia – it was the latter that Mahan considered more threatening to the fate of Central Asia. Mahan was impressed by Russia's transcontinental size and strategically favorable position for southward expansion. Therefore, he found it necessary for the Anglo-Saxon "sea power" to resist Russia. Homer Lea in The Day of the Saxon (1912) described that the entire Anglo-Saxon race faced a threat from German (Teuton), Russian (Slav), and Japanese expansionism: The "fatal" relationship of Russia, Japan, and Germany "has now assumed through the urgency of natural forces a coalition directed against the survival of Saxon supremacy." It is "a dreadful Dreibund". Lea believed that while Japan moved against Far East and Russia against India, the Germans would strike at England, the center of the British Empire. He thought the Anglo-Saxons faced certain disaster from their militant opponents. Two famous Security Advisers from the Cold War period, Henry Kissinger and Zbigniew Brzezinski, argued to continue the United States geopolitical focus on Eurasia and, particularly on Russia, despite the dissolution of the USSR and the end of the Cold War. Both continued their influence on geopolitics after the end of the Cold War, writing books on the subject in the 1990s—Diplomacy (Kissinger 1994) and The Grand Chessboard: American Primacy and Its Geostrategic Imperatives. The Anglo-American classical geopolitical theories were revived. Kissinger argued against the approach that with the dissolution of the USSR hostile intentions had disappeared and traditional foreign policy considerations no longer applied. "They would argue … that Russia, regardless of who govern it, sits astride the territory Halford Mackinder called the geopolitical heartland, and is the heir to one of the most potent imperial traditions." Therefore the United States must "maintain the global balance of power vis-à-vis the country with a long history of expansionism." After Russia, the second geopolitical threat remained Germany and, as Mackinder had feared ninety years ago, its partnership with Russia. During the Cold War, Kissinger argues, both sides of the Atlantic recognized that, "unless America is organically involved in Europe, it would be obliged to involve itself later under circumstances far less favorable to both sides of the Atlantic. That is even more true today. Germany has become so strong that existing European institutions cannot by themselves strike a balance between Germany and its European partners. Nor can Europe, even with Germany, manage by itself […] Russia." Thus Kissinger belied it is in no country's interest that Germany and Russia should fixate on each other as a principal partner. They would raise fears of condominium. [clarification needed] Without America, Britain and France cannot cope with Germany and Russia; and "without Europe, America could turn … into an island off the shores of Eurasia." Having converted from ideologist into geopolitician, Kissinger in retrospect interpreted the Cold War in geopolitical terms—an approach not characteristic for his works during the Cold War. Now, however, he stressed on the beginning of the Cold War: "The objective of moral opposition to Communism had merged with the geopolitical task of containing the Soviet expansion." Nixon, he added, was geopolitical rather than ideological cold warrior. Three years after Kissinger's Diplomacy, Brzezinski followed suit, launching The Grand Chessboard: American Primacy and Its Geostrategic Imperatives and, after three more years, The Geostrategic Triad: Living with China, Europe, and Russia. The Grand Chessboard described the American triumph in the Cold War in terms of control over Eurasia: for the first time ever, a "non-Eurasian" power had emerged as a key arbiter of "Eurasian" power relations. The book states its purpose: "The formulation of a comprehensive and integrated Eurasian geostrategy is therefore the purpose of this book." Although the power configuration underwent a revolutionary change, Brzezinski confirmed three years later, Eurasia was still a megacontinent. Like Spykman, Brzezinski acknowledges that: "Cumulatively, Eurasia's power vastly overshadows America's." In classical Spykman terms, Brzezinski formulized his geostrategic "chessboard" doctrine of Eurasia, which aims to prevent the unification of this megacontinent. "Europe and Asia are politically and economically powerful…. It follows that… American foreign policy must…employ its influence in Eurasia in a manner that creates a stable continental equilibrium, with the United States as the political arbiter.… Eurasia is thus the chessboard on which the struggle for global primacy continues to be played, and that struggle involves geo- strategy – the strategic management of geopolitical interests…. But in the meantime it is imperative that no Eurasian challenger emerges, capable of dominating Eurasia and thus also of challenging America… For America the chief geopolitical prize is Eurasia…and America's global primacy is directly dependent on how long and how effectively its preponderance on the Eurasian continent is sustained." The Austro-Hungarian historian Emil Reich (1854–1910) is considered to be the first having coined the acceptance in English as early as 1902 and later published in England in 1904 in his book Foundations of Modern Europe. Sir Halford Mackinder's Heartland concept showing the situation of the "pivot area" established in the Theory of the Heartland. He later revised it to mark Northern Eurasia as a pivot while keeping area marked above as Heartland. Sir Halford Mackinder's Heartland Theory initially received little attention outside geography, but some thinkers would claim that it subsequently influenced the foreign policies of world powers. Those scholars who look to MacKinder through critical lenses accept him as an organic strategist who tried to build a foreign policy vision for Britain with his Eurocentric analysis of historical geography. His formulation of the Heartland Theory was set out in his article entitled "The Geographical Pivot of History", published in England in 1904. Mackinder's doctrine of geopolitics involved concepts diametrically opposed to the notion of Alfred Thayer Mahan about the significance of navies (he coined the term sea power) in world conflict. He saw navy as a basis of Colombian era empire (roughly from 1492 to the 19th century), and predicted the 20th century to be domain of land power. The Heartland theory hypothesized a huge empire being brought into existence in the Heartland—which wouldn't need to use coastal or transoceanic transport to remain coherent. The basic notions of Mackinder's doctrine involve considering the geography of the Earth as being divided into two sections: the World Island or Core, comprising Eurasia and Africa; and the Peripheral "islands", including the Americas, Australia, Japan, the British Isles, and Oceania. Not only was the Periphery noticeably smaller than the World Island, it necessarily required much sea transport to function at the technological level of the World Island—which contained sufficient natural resources for a developed economy. Who rules Central and Eastern Europe commands the Heartland. Who rules the Heartland commands the World-Island. Who rules the World-Island commands the World. The Offshore Islands & Continents (Mackinder's "outer or insular crescent"). Under Spykman's theory, a Rimland separates the Heartland from ports that are usable throughout the year (that is, not frozen up during winter). Spykman suggested this required that attempts by Heartland nations (particularly Russia) to conquer ports in the Rimland must be prevented. Spykman modified Mackinder's formula on the relationship between the Heartland and the Rimland (or the inner crescent), claiming that "Who controls the rimland rules Eurasia. Who rules Eurasia controls the destinies of the world." This theory can be traced in the origins of Containment, a U.S. policy on preventing the spread of Soviet influence after World War II (see also Truman Doctrine). Another famous follower of Mackinder was Karl Haushofer who called Mackinder's Geographical Pivot of History a "genius' scientific tractate." He commented on it: "Never have I seen anything greater than those few pages of geopolitical masterwork." Mackinder located his Pivot, in the words of Haushofer, on "one of the first solid, geopolitically and geographically irreproachable maps, presented to one of the earliest scientific forums of the planet – the Royal Geographic Society in London" Haushofer adopted both Mackinder's Heartland thesis and his view of the Russian-German alliance – powers that Mackinder saw as the major contenders for control of Eurasia in the twentieth century. Following Mackinder he suggested an alliance with the Soviet Union and, advancing a step beyond Mackinder, added Japan to his design of the Eurasian Bloc. In 2004, at the centenary of The Geographical Pivot of History, famous Historian Paul Kennedy wrote: "Right now with hundreds of thousands of US troops in the Eurasian rimlands and with administration constantly explaining why it has to stay the course, it looks as if Washington is taking seriously Mackinder's injunction to ensure control of the geographical pivot of history." German Geopolitik is characterized by the belief that life of States—being similar to those of human beings and animals—is shaped by scientific determinism and social Darwinism. German geopolitics develops the concept of Lebensraum (living space) that is thought to be necessary to the development of a nation like a favorable natural environment would be for animals. Friedrich Ratzel (1844–1904), influenced by thinkers such as Darwin and zoologist Ernst Heinrich Haeckel, contributed to 'Geopolitik' by the expansion on the biological conception of geography, without a static conception of borders. Positing that states are organic and growing, with borders representing only a temporary stop in their movement, he held that the expanse of a state's borders is a reflection of the health of the nation—meaning that static countries are in decline. Ratzel published several papers, among which was the essay "Lebensraum" (1901) concerning biogeography. Ratzel created a foundation for the German variant of geopolitics, geopolitik. Influenced by the American geostrategist Alfred Thayer Mahan, Ratzel wrote of aspirations for German naval reach, agreeing that sea power was self-sustaining, as the profit from trade would pay for the merchant marine, unlike land power. The geopolitical theory of Ratzel has been criticized as being too sweeping, and his interpretation of human history and geography being too simple and mechanistic. Critically, he also underestimated the importance of social organization in the development of power. After World War I, the thoughts of Rudolf Kjellén and Ratzel were picked up and extended by a number of German authors such as Karl Haushofer (1869–1946), Erich Obst, Hermann Lautensach and Otto Maull. In 1923, Karl Haushofer founded the Zeitschrift für Geopolitik (Journal for Geopolitics), which was later used in the propaganda of Nazi Germany. The key concepts of Haushofer's Geopolitik were Lebensraum, autarky, pan-regions, and organic borders. States have, Haushofer argued, an undeniable right to seek natural borders which would guarantee autarky. Haushofer's influence within the Nazi Party has recently been challenged, given that Haushofer failed to incorporate the Nazis' racial ideology into his work. Popular views of the role of geopolitics in the Nazi Third Reich suggest a fundamental significance on the part of the geo-politicians in the ideological orientation of the Nazi state. Bassin (1987) reveals that these popular views are in important ways misleading and incorrect. Despite the numerous similarities and affinities between the two doctrines, geopolitics was always held suspect by the National Socialist ideologists. This was understandable, for the underlying philosophical orientation of geopolitics did not comply with that of National Socialism. Geopolitics shared Ratzel's scientific materialism and geographic determinism, and held that human society was determined by external influences—in the face of which qualities held innately by individuals or groups were of reduced or no significance. National Socialism rejected in principle both materialism and determinism and also elevated innate human qualities, in the form of a hypothesized 'racial character,' to the factor of greatest significance in the constitution of human society. These differences led after 1933 to friction and ultimately to open denunciation of geopolitics by Nazi ideologues. Nevertheless, German Geopolitik was discredited by its (mis)use in Nazi expansionist policy of World War II and has never achieved standing comparable to the pre-war period. The resultant negative association, particularly in U.S. academic circles, between classical geopolitics and Nazi or imperialist ideology, is based on loose justifications. This has been observed in particular by critics of contemporary academic geography, and proponents of a "neo"-classical geopolitics in particular. These include Haverluk et al., who argue that the stigmatization of geopolitics in academia is unhelpful as geopolitics as a field of positivist inquiry maintains potential in researching and resolving topical, often politicized issues such as conflict resolution and prevention, and mitigating climate change. Negative associations with the term "geopolitics" and its practical application stemming from its association with World War II and pre-World War II German scholars and students of Geopolitics are largely specific to the field of academic Geography, and especially sub-disciplines of Human Geography such as Political Geography. However, this negative association is not as strong in disciplines such as History or Political Science, which make use of geopolitical concepts. Classical Geopolitics forms an important element of analysis for Military History as well as for subdisciplines of Political Science such as International Relations and Security Studies. This difference in disciplinary perspectives is addressed by Bert Chapman in Geopolitics: A Guide To the Issues, in which Chapman makes note that academic and professional International Relations journals are more amenable to the study and analysis of Geopolitics, and in particular Classical Geopolitics, than contemporary academic journals in the field of Political Geography. In disciplines outside Geography, Geopolitics is not negatively viewed (as it often is among academic geographers such as Carolyn Gallaher or Klaus Dodds) as a tool of Imperialism or associated with Nazism, but rather viewed as a valid and consistent manner of assessing major international geopolitical circumstances and events, not necessarily related to armed conflict or military operations. 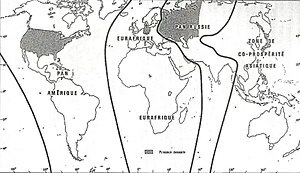 French geopolitical doctrines broadly opposed to German Geopolitik and reject the idea of a fixed geography. French geography is focused on the evolution of polymorphic territories being the result of mankind's actions. It also relies on the consideration of long time periods through a refusal to take specific events into account. This method has been theorized by Professor Lacoste according to three principles: Representation; Diachronie; and Diatopie. In The Spirit of the Laws, Montesquieu outlined the view that man and societies are influenced by climate. He believed that hotter climates create hot-tempered people and colder climates aloof people, whereas the mild climate of France is ideal for political systems. Considered as one of the founders of French geopolitics, Élisée Reclus, is the author of a book considered as a reference in modern geography (Nouvelle Géographie universelle). Alike Ratzel, he considers geography through a global vision. However, in complete opposition to Ratzel's vision, Reclus considers geography not to be unchanging; it is supposed to evolve commensurately to the development of human society. His marginal political views resulted in his rejection by academia. French geographer and geopolitician Jacques Ancel is considered to be the first theoretician of geopolitics in France, and gave a notable series of lectures at the European Center of the Carnegie Endowment for International Peace in Paris and published Géopolitique in 1936. Like Reclus, Ancel rejects German determinist views on geopolitics (including Haushofer's doctrines). Braudel's broad view used insights from other social sciences, employed the concept of the longue durée, and downplayed the importance of specific events. This method was inspired by the French geographer Paul Vidal de la Blache (who in turn was influenced by German thought, particularly that of Friedrich Ratzel whom he had met in Germany). Braudel's method was to analyse the interdependence between individuals and their environment. Vidalian geopolitics is based on varied forms of cartography and on possibilism (founded on a societal approach of geography—i.e. on the principle of spaces polymorphic faces depending from many factors among them mankind, culture, and ideas) as opposed to determinism. Diachronie. Conducting an historical analysis confronting "long periods" and short periods as the prominent French historian Fernand Braudel suggested. Diatopie: Conducting a cartographic survey through a multiscale mapping. Connected with this stream, and former member of Hérodote editorial board, the French geographer Michel Foucher developed a long term analysis of international borders. He coined various neologism among them: Horogenesis: Neologism that describes the concept of studying the birth of borders, Dyade: border shared by two neighbouring states (for instance US territory has two terrestrial dyades : one with Canada and one with Mexico). The main book of this searcher "Fronts et frontières" (Fronts and borders) first published in 1991, without equivalent remains as of yet untranslated in English. Michel Foucher is an expert of the African Union for borders affairs. More or less connected with this school, Stéphane Rosière can be quoted as the editor in Chief of the online journal L'Espace politique, this journal created in 2007 became the most prominent French journal of political geography and Geopolitics with Hérodote. A much more conservative stream is personified by François Thual. Thual was a French expert in geopolitics, and a former official of the Ministry of Civil Defence. Thual taught geopolitics of the religions at the French War College, and has written thirty books devoted mainly to geopolitical method and its application to various parts of the world. He is particularly interested in the Orthodox, Shiite, and Buddhist religions, and in troubled regions like the Caucasus. Connected with F. Thual, Aymeric Chauprade, former professor of geopolitics at the French War College and now member of the extreme-right party "Front national", subscribes to a supposed "new" French school of geopolitics which advocates above all a return to realpolitik and "clash of civilization" (Huntington). The thought of this school is expressed through the French Review of Geopolitics (headed by Chauprade) and the International Academy of Geopolitics. Chauprade is a supporter of a Europe of nations, he advocates a European Union excluding Turkey, and a policy of compromise with Russia (in the frame of a Eurasian alliance which is en vogue among European extreme-right politists) and supports the idea of a multipolar world—including a balanced relationship between China and the U.S.
French philosopher Michel Foucault's dispositif introduced for the purpose of biopolitical research was also adopted in the field of geopolitical thought where it now plays a central role. In the 1990s a senior researcher at the Institute of Philosophy, Russian Academy of Sciences of the Russian Academy of Sciences, Vadim Tsymbursky [ ru ] (1957-2009), coined the term "island-Russia" and developed the "Great Limitrophe" concept. Colonel-General Leonid Ivashov (retired), a Russian geopolitics specialist of the early 21st century, headed the Academy of Geopolitical Problems (Russian: Академия геополитических проблем), which analyzes the international and domestic situations and develops geopolitical doctrine. Earlier, Colonel-General Leonid Ivashov headed the Main Directorate for International Military Cooperation of the Ministry of Defence of the Russian Federation. Aleksandr Dugin, a Russian fascist and nationalist who has developed a close relationship with Russia's Academy of the General Staff wrote "The Foundations of Geopolitics: The Geopolitical Future of Russia" in 1997, which has had a large influence within the Russian military, police, and foreign policy elites. ^ Devetak et al. (eds), An Introduction to International Relations, 2012, p. 492. ^ a b c Overland, Indra (2015). "Future Petroleum Geopolitics: Consequences of Climate Policy and Unconventional Oil and Gas": 3517–3544. doi:10.1002/9781118991978.hces203 – via Researchgate. ^ Vladimir Toncea, 2006, "Geopolitical evolution of borders in Danube Basin"
^ Gogwilt, Christopher (2000). The Fiction of Geopolitics. Stanford University Press. p. 1. ISBN 978-0804737319. Retrieved 2016-02-24. ^ Jason Dittmer, Jo Shar (2014). Geopolitics: An Introductory Reader. Routledge. p. 64. ^ Deudney, Daniel. "Geopolitics as Theory: Historical Security Materialism" (PDF). ^ Overland, Indra; O'Sullivan, Meghan; Sandalow, David; Vakulchuk, Roman; Lemphers, Nathan; Begg, Harry; Behrens, Arno; Bhatiya, Neil; Clark, Alex (2017-06-30). The Geopolitics of Renewable Energy. https://www.researchgate.net/publication/317954274_The_Geopolitics_of_Renewable_Energy: Harvard University. ^ Alfred Thayer Mahan, The Problem of Asia and the Effects upon International Politics, (Washington and London: Kennikat Press, 1920, p 26-27). ^ Alfred Thayer Mahan, The Problem of Asia and the Effects upon International Politics, (Washington and London: Kennikat Press, 1920, p 25-27, 167-8, 172). ^ The Day of the Saxon, (New York & London: Harper and Brothers, 1912, p 122). ^ Christopher Lloyd GoGwilt, "The Geopolitical Image: Imperialism, Anarchism, and the Hypothesis of Culture in the Formation of Geopolitics", Modernism/modernity, Volume 5, Number 3, September 1998, pp. 49–70 et The Fiction of Geopolitics: Afterimages of Culture, from Wilkie Collins to Alfred Hitchcock. Stanford. Stanford University Press, 2000, pp. 35–36. ^ Sloan, G.R. "Sir Halford Mackinder: the heartland theory then and now", in Gray C S and Sloan G.R., Geopolitics, geography and strategy. London: Frank Cass, pp. 15–38. ^ See map in Polelle, Raising Cartographic Consciousness, p. 57. ^ See map in Polelle, Raising Cartographic Consciousness, p. 118. ^ Karl Haushofer, Pan-Ideas in Geopolitics, 1931, (tr. Usachev I. G., Mysl', Moscow, 2004, p 312). ^ Michael Heffernan, The Meaning of Europe: Geography and Geopolitics, (London & New York: Arnold, 1998, p 134). ^ Karl Haushofer, "Pan-Ideas in Geopolitics", 1931, (tr. Usachev I. G., Mysl', Moscow, 2004, p 312). ^ Karl Haushofer, "The Continental Bloc: Mittel Europa – Eurasia – Japan," 1941, (tr. Usachev I. G., Mysl', Moscow, 2004). ^ cited in Klaus Dodds & James Sidaway, "Halford Mackinder and the 'Geographical Pivot of History': a Centennial Retrospective," Geographical Journal, 170/4, (2004): p 292. ^ "The Three Critical Flaws of Critical Geopolitics: Towards a Neo-Classical Geopolitics". Geopolitics. 19: 19–39. doi:10.1080/14650045.2013.803192. ^ See: Kariakin, V. V. (2013). Geopolitika Tretiei Volny: Transformatsiia Mira v Epokhu Postmoderna [Geopolitics of the third wave : The transformation of the world in the postmodern epoch] (in Russian). Moscow: Granitsa. ISBN 9785946915632. ^ "The Unlikely Origins of Russia's Manifest Destiny". Foreign Policy. Retrieved 2017-10-23. Amineh, Parvizi M.; Houweling, Henk. Central Eurasia in Global Politics. London: Brill Academic Publishing. Introduction; Chapter 11. Ankerl, Guy (2000). Global communication without universal civilization. INU societal research. 1. Geneva: INU Press. ISBN 2-88155-004-5. Devetak, Richard; Burke, Anthony; George, Jim, eds. (2011). An Introduction to International Relations. Cambridge: Cambridge University Press. ISBN 978-1-107-60000-3. Diamond, Jared (1997). Guns, Germs, and Steel. Kovacevic, Filip (2014). Teoretičari klasične geopolitike: ciklus predavanja. Podgorica: Centar za gradjansko obrazovanje. ISBN 978-86-85591-43-3. O'Loughlin, John; Heske, Henning (1991). Kliot, N; Waterman, S, eds. From War to a Discipline for Peace. The Political Geography of Conflict and Peace. London: Belhaven Press. Spang, Christian W. (2006). Spang, C. W.; Wippich, R.H., eds. Karl Hausofer Re-examined: Geopolitics As a Factor within Japanese-German Rapprochement in the Inter-War Years?. Japanese-German Relations, 1895–1945: War, Diplomacy and Public Opinion. London. pp. 139–157. Spang, Christian W. (2013). Karl Haushofer und Japan. Die Rezeption seiner geopolitischen Theorien in der deutschen und japanischen Politik. Munich: Iudicium. ISBN 978-3-86205-040-6. Venier, Pascal (2010), "Main Theoretical Currents in Geopolitical Thought in the Twentieth Century", L'Espace Politique, vol. 12, no 3, 2010. (in French) The Eyes of the World is a French geopolitical website, based on the legacy of the French geopolitcal School, focused on the analysis of the most important world news. Global Consulting Services – Geopolitical Information Service AG, founded by H.S.H Prince Michael of Liechtenstein. All content is written by leading global experts in their respective fields.